Disagree with me after you ponder this question: If Ford were to release a luxurious, RWD, performance car this year, would they sell more of them as Lincolns or Fords? Ford is an international brand, with history, existing performance cars, a racing pedigree, and a rabid fan base that will happily explain to you what a horrible mistake your Chevrolet purchase was. Lincoln is exclusive to North America. 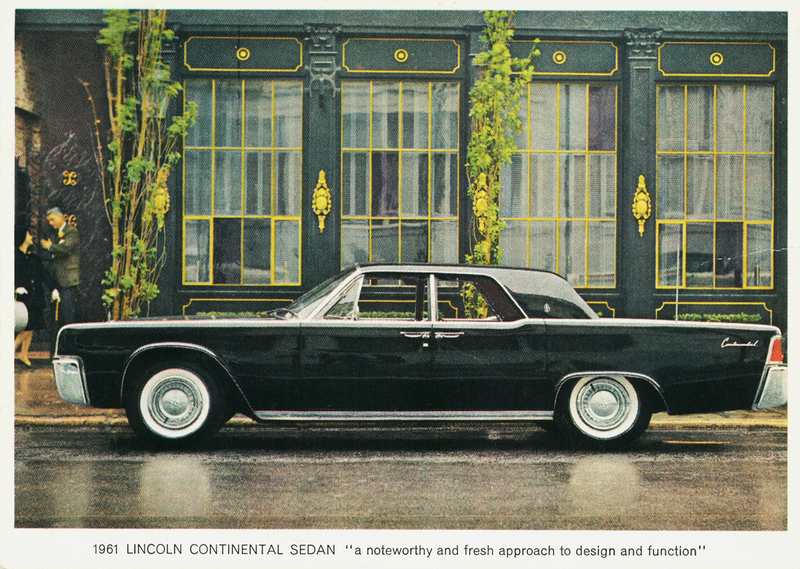 Lincoln has a history stained by Henry Ford's initial betrayal, John F Kennedy's brains, and the late 90's Continental. And the majority of Lincoln fans are now dead. In addition to the Mustang and the coming GT, Ford also has the Fiesta ST, Focus ST, Focus RS, and the trucks. Lincoln's current MKZ is actually surpassed in quickness both by the retired Lincoln Mk VIII (which inspired the EmKay naming scheme) and the Lincoln LS. Whatever enthusiasts want Lincoln to make, would sell better as a Ford. The GT is proof that common sense about what Lincoln needs to do: is wrong. The deafening screams of joy that the GT ignited would have been quieted by making it a Lincoln, and would have caged the beast into North America. Before I begin to sound like I'm trashing Lincoln: Speed is not everything. Today a luxury automobile needs to be quick and handle well, but Lincoln paradoxically can't compete on those virtues. While Lincoln has to build cars that handle well, nobody will ever choose a Lincoln over a BMW due to handling. While Lincoln has to make cars that are fast, no one will ever choose a Lincoln over Audi due to speed. Lincoln has to compete on other virtues, and they know it. Take a look at the descriptions to the side. These are pulled from the main headings on the Lincoln Motor Company official website. Ignore the fact that even Lincoln can't figure out what the point of the MKT is and notice that performance is never even implied. Performance is only mentioned on the Navigator's page, and considering what the Navigator is, Lincoln must mean something other than reckless driving on winding roads. The MKC has "style" and the MKZ has "class" but Lincoln knows that they haven't had a "performance" vehicle since they killed the LS. There's still no follow up to the Lincoln LS for a good reason: every year of that sedan's life the LS was badly outsold by the couch-on-wheels Town Car. This is why Lincolns now come standard with panoramic sunroofs. When a car is being designed to handle well, none of the engineers ever suggest, "hey, let's cut a great, big hole in the roof," because that makes the chassis floppier. But with the lesser handling come benefits. A large sunroof makes the interior brighter, airier, and more like a Tennessee front porch. This is why Lincoln thinks they want to sell to the younger generation. Other auto manufacturers are moaning about how "kids these days" don't appreciate the billions they've squandered on making $30,000+ appliances that break the speed limit before they red line. Lincoln recognizes that these younger generations want something that BMW, Audi, Mercedes, Lexus, and Cadillac aren't offering. Lincoln just hasn't quite figured out what that something is yet. Figure out what a Lincoln is. They must identify the positive qualities that Lincoln currently has and can have in the future, especially positive qualities that the Germans have neglected. Then they have to distill down the essence of Lincoln into one word. A mantra, a goal, a verb. If IBM solves and Volvo saves, what does Lincoln do? Build the best Lincoln they can. They don't need a mustang with a body kit, they need flagship and halo cars that build on the best qualities of the MKZ, MKC, and recently departed Town Car. They need erotically comfortable interiors, spaceship features, and no roof. They need a something lust-worthy that doesn't make sense as a Ford or even a BMW. Convince the public. The biggest obstacle to Lincoln's success will be convincing the public what a Lincoln is. The Volkswagen Phaeton died a brutal death because Volkswagen refused to put Audi or Bentley or badges on it. Most people spending the money on a luxury car want not just the metal, but the prestige that goes with it. Cadillac has been building great cars for over a decade now, but their revolving door of ad agencies in disagreement have done only one thing consistently: fail to communicate to the general public what a Cadillac does. Lincoln has been walking away from performance for a long time, if they run back now they'll be forever chasing the BMW on the horizon and never close the gap. Lincoln can't compete with BMW any more than Land Rover can, but Lincoln doesn't have to compete with BMW any more than Land Rover does. Lincoln can find success in carving their own path. If Lincoln does decide to build the Right Wheel Drive, V8, turbocharged, manual transmission, corner carving, monster that enthusiasts think they want: that car will be loved. That car will become a collectible classic remembered as fondly as the Marauder on Mercury's tombstone. Did Oppo and Jalopnik break up? Strange things in your tape deck can open up a world of possibilities.